Japanese companies that have built up technological capabilities and know-how through their involvement in the nation’s space program are now offering development and manufacturing services to customers producing commercial satellites for purposes including communications, broadcasting, and meteorology. Moreover, they are providing launch services for global customers seeking to put their commercial satellites into orbit. 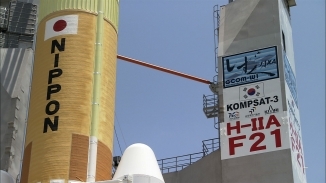 The H-IIA launch vehicle is Japan's primary large-scale launch vehicle, which uses liquid oxygen and liquid hydrogen as a propellant. It was developed by JAXA, building upon the technology developed for Japan's first, purely domestic launch vehicle, the H-II. H-IIA202, with two solid boosters, has launch capability of 4 tonnes to a geostationary transfer orbit, and the H-IIA204, with four solid boosters, has launch capability of 6 tonnes. The LE-5B second-stage engine is restartable, and can accommodate multiple launch missions. After the technology transfer from JAXA, Mitsubishi Heavy Industries, Ltd. took over the H-IIA launch service operations, starting with the launch of the H-IIA Launch Vehicle No.13 in 2007. 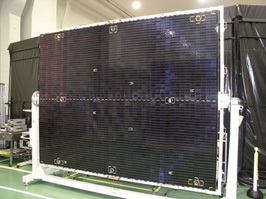 In 2009, the company signed a contract with its first international client, South Korea's Earth observation satellite KOMPSAT-3, which was launched with JAXA's Earth observation satellite GCOM-W in 2011. DS2000 is a standard geostationary communications satellite bus made by one of Japan's major general electronics manufacturers, Mitsubishi Electric Corporation. It has achieved 8-kW power generation in a satellite with a launch weight of approx. 4 tonnes, and can achieve up to a maximum of 12 kW. The experience and achievements Mitsubishi Electric has derived from participating in JAXA space projects over the last few decades are incorporated in this high powered and highly reliable platform. There have been ten orders placed for DS2000 from Japan and overseas. 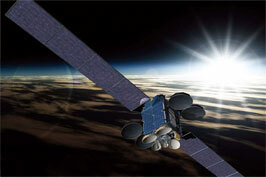 Client projects include the JAXA quasi-zenith satellite MICHIBIKI; ST-2, a joint-venture communication satellite by Singapore and Taiwan; and Turksat-4A and 4B, by Turksat Satellite Communication, Cable TV and Operation AS. NEXTAR is a standard satellite bus system that is in development by one of Japan's major general electronics manufacturers, NEC. 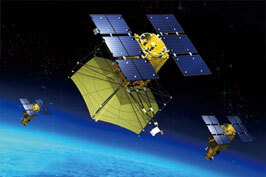 It uses the spacecraft communication technology SpaceWire to network the satellite's instruments. The satellite bus system has achieved a bus dry mass of 250 kg, payload mass capability of 200 kg max, and payload power supply of 400 W. NEXTAR's goal is to achieve quick delivery, low cost and high flexibility. Many advanced technologies which were developed for scientifics spacecraft and Earth observing satellites including JAXA's asteroid explorer HAYABUSA and Advanced Land Observing Satellite DAICHI are incorporated into NEXTAR. The NEXTAR bus system was adopted for the ASNARO satellite, which was developed by the Institute for Unmanned Space Experiment Free Flyer (USEF). Many of the components supplied by Japanese companies for use in satellites and other spacecraft substantial shares in the global market. Thanks to the skills that Japanese firms have developed in producing devices that are small, light, and reliable, their components have won the confidence of commercial satellite manufacturers around the globe. 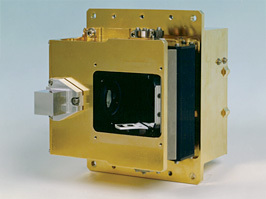 PROX, short for Proximity Communication System, is a set of communication equipments developed for use in the H-II Transfer Vehicle (HTV), which delivers cargo to the space station. The equipment is indispensable for enabling the HTV to dock safely with the space station. Mitsubishi Electric is also marketing PROX to users abroad, and it has been selected for installation in the Cygnus unmanned resupply spacecraft being developed by Orbital Sciences Corp. in the United States. While bathed in sunlight, satellites use solar panels to generate the electric power that they require to operate all onboard equipment. Mitsubishi Electric Corp. and NEC Corp. provide many solar panels to the world. Mitsubishi Electric has been selling solar panels for commercial communication satellites since the late 1980s and now holds about 50% of the global market for these components. The company's strengths include the low weight and reasonable costs of its solar panels and its extensive line of panels for specific uses in various types of satellites, available at prices to match users' needs. 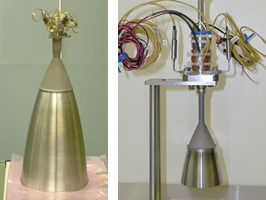 IHI Aerospace Co., Ltd., holds about 25% of the market for satellite thrusters--the small engines used to maintain satellites' orbital positions and precisely control their attitude (orientation). An important feature of IHI Aerospace's thrusters is their superior fuel economy, which prolongs a satellite's useful life. Lithium-ion batteries store power for satellites to use when their orbits take them through the Earth's shadow. 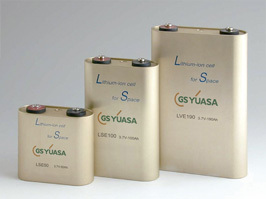 GS Yuasa Technology Ltd. manufactures the cells, and Mitsubishi Electric assembles and sells the batteries. These batteries boast the longest life and highest energy density of any such products, and they account for 35% of the global commercial communication satellite market. ©NEC Toshiba Space Systems, Ltd.
Transponders receive weak radio signals from Earth, amplify them, and transmit them back to Earth. They are thus core components for communications and broadcasting satellites. NEC's transponders are being used by many satellite integrators around the world since they are highly compact and extremely light. 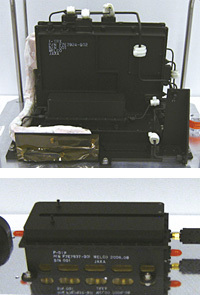 The devices are manufactured by NEC Toshiba Space Systems, Ltd., a company jointly established by NEC and Toshiba Corp.
Earth sensors are indispensable for keeping the antennas of communications and broadcasting satellites pointed in exactly the right direction by determining the orientation of the satellite relative to the Earth. 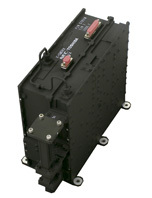 This is essential to maintain the steady stream of signals between the ground and the satellite. Approximately 50% of the market for such sensors in communications and broadcasting satellites is held by NEC, whose sensors combine high detection accuracy and superior reliability.